Conan Exiles is one of the free games available to PS Plus subscribers this month and its survival mechanics can be pretty tricky to get to grips with. Here’s everything you need to know about how to cook food in Conan Exiles. 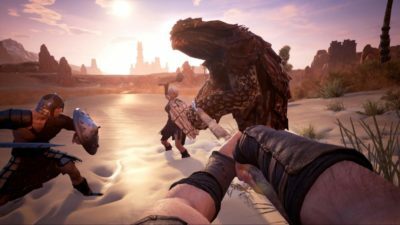 While you’ll find little food items littered around the world as you explore in Conan Exiles, they don’t do a lot to dispel your character’s hunger. Instead, you’ll need to get meat from animals in the game if you want to survive for as long as possible. You’ll get raw meats of different kinds from killing animals, but you’ll need to cook them before eating them. The best way to do so is by using campfires, which you get access to once you hit level three. You don’t need just the raw meat and the campfire, however; you also need a fuel of some kind. You can use wood or coal, which you’ll need to put on the campfire before the meat. Since it can be tricky, here’s a run down of exactly what you need to do to cook food in Conan Exiles. Put whatever fuel source you’re using in one of the slots on the campfire. Use the raw meat in one of the other slots. Start it up with the on button. Watch the queue in the bottom right of the screen to see how long the cooking process has left. Once each piece is done, you’ll be able to eat it and gain health. Do note, however, that most food will make your character thirsty, so be sure to have a water source handy. That’s everything you need to know about how to cook food in Conan Exiles. For more tips and tricks on the game, be sure to search for Twinfinite.